These are basically two different jobs. For you to be successful as an artist, you have to have a balance between these two. You can’t neglect one or the other. You have to draw or paint, and you have to sell. However, this is the number one reason why so many artists starve! (I gear each of my posts in the ARTpreneur section towards artists who want to run a profitable art business. I am totally aware of the fact that there are people out there who just want to create art for themselves. And this is perfectly fine. But then there are those artists who do what they love AND try to make a living out of this passion of theirs). The Artist would spend the majority of his time in the studio creating art. The finished pieces are then shipped to a gallerist. The Gallerist would spend his time marketing and promoting these artworks and would get up to 50% of the sales price. The Artist spends the majority of his time in the studio creating art – nothing changes here – BUT he cuts out the gallerist. With social media and free websites, many artists don’t see the need for someone else doing the marketing job any longer. They think that uploading a few pictures now and then is all there is to it – and if this means up to 50% more money for the artist – well this sounds like a win! On the other hand they don’t have the desire or time to learn about the marketing side and this leaves them WITHOUT marketing at all. In the long run they don’t ‘lose’ 50% to a marketer but 100% because there is no sale happening at all. To sell Art, you have to be successful in Marketing your art. You can’t ‘hide’ in your studio drawing and expecting to get sales. 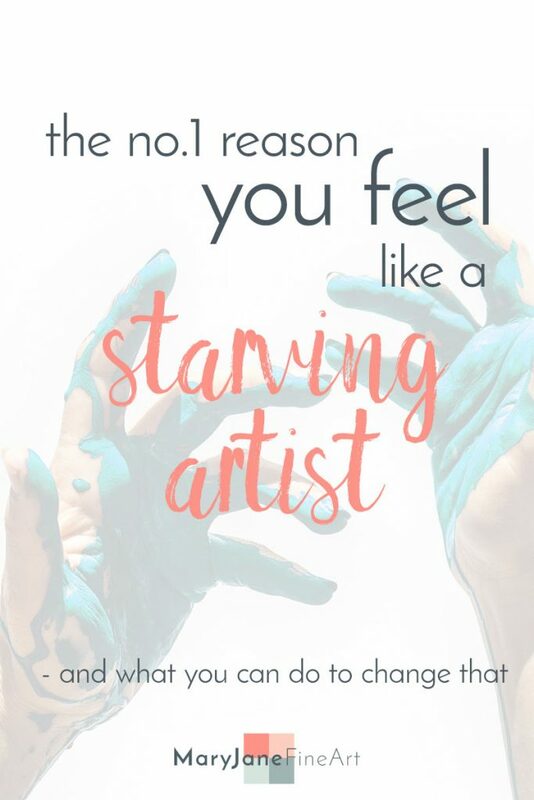 This is one of our biggest struggles as self-taught artists. One reason for this is the lack of an art degree. Okay, okay, calm down, and please continue reading! I am not saying that people who have an art degree can draw or paint better. However, half of the time studying art they learn marketing and building up the confidence that is crucial to make those sales. (And in the pre-social-media era they would get the first connections to galleries and tips on how to get into them). Do people know that they can buy your Art, and how to do so? Are you confident and believe in your skills? If you hesitate in one way or the other, the customer will notice this and is not going to buy. If you don’t believe in yourself why should he/she do it? Same with your prices. Are you feeling confident when quoting your patrons? If you struggle around when someone asks for a price he or she will think something is fishy or that there is something wrong with it. Do you know to whom you want to sell your art? You need to know your ideal customer and put all your energy into marketing to them. Seek for people who really love what you do. Sell directly to them. Don’t try to sell to everyone. Niche it down. Lastly, don’t forget that you can’t force people to love your Art. Maybe your branding and marketing attract a different target market than your artwork. Today we are in the unique position that we can market to the whole world, and there are buyers for everything you can imagine. So I am confident that there are more than enough people interested in what you do. You have to find them and talk to them in their language. In every other business we call this branding. And I have some branding experts in my Facebook group. You have to invest your time or your money to do that second job that has to be done: Marketing.